We are a group of dynamic believers whose lives have been transformed by the good news of Jesus Christ. We seek to be faithful to God by gathering for corporate worship, preaching his word, and growing in our love for one another. We have been blessed to see God work through this church in Imlay City and the surrounding area for 75 years. We welcome all to visit our church to find hope and healing in Jesus Christ. We seek to make God's name known in Imlay City and the surrounding regions, and to share in the love of Christ together. We are commited to growing together as the family of God. We believe in the gospel of Jesus Christ as revealed in God's Word. We seek to submit to the authority of God's Word in all things. You can read our statement of faith by clicking HERE. If you are weary, if you are heavy laden, if you need encouragement, please join with us. We gather to enjoy the support of God and of each other. Share with us in the gracious rest which God provides. Pastor Tim has been serving at Trinity Baptist Church of Imlay City (TBCic) since November 1st, 2014. He graduated from Pensacola Christian College in 2001, where he met his wife (Pam). The Ericsons have been married since June of 2002 and are blessed with four children (Olivia, Aiden, Ellynn, and Illanna). 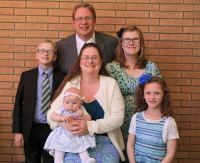 Pastor Tim served in lay ministry at First Baptist Church of Lapeer, Michigan; where he was ordained for the Ministry of God’s Word by a council of pastors on October 4th, 2014.